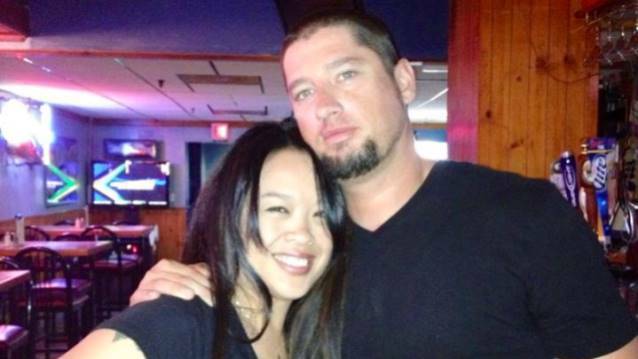 ***UPDATE (Sunday, June 22 at 11:11 a.m. EST) ***: The body of Bob Bielarz's wife, Viengsavanh Bielarz, 40, has now been recovered. Bob Bielarz is among those still missing. Bob Bielarz, guitarist for the Chicago, Illinois nu-metal band NO ONE, and his wife are believed to be among four people missing after a boat capsized in the Cal-Sag Channel near Palos Hills, Illinois, Friday night, according to ABC 7 Chicago. The 19-foot boat collided with a 66-foot commercial towing vessel around 11 p.m., according to the Coast Guard. Police responded after getting several calls from people reporting a loud noise on the river near the Southwest Highway Canal Bridge in Palos Heights. "We were able to locate the barge east of the southwest highway, we were able to get flashlights down there, and there was a small pleasure craft visible that had been capsized," said Sgt. Jeff Crowley, Palos Heights Police Department. "Originally on scene there were no visible persons in the water." Greg Bielarz, Bob Bielarz's brother, said about Bob: "He's a big dude, iron worker, worked out a lot, musician, artist. A lot of hope, wishful thinking, hope for the best." Greg told NBC 5 Chicago: "They go out boating every week, have fun. They know there's barges, they know the dangers, but things happen." NO ONE released one studio album through Immortal Records in August 2001 and performed on the Ozzfest tour that year alongside SLIPKNOT and SYSTEM OF A DOWN. After achieving only minimal commercial success, the group disbanded in 2003. They reformed in 2010 and began performing concerts again.